If you’re looking for a practical and effective way to operate your sash windows, we have a wide selection of high-quality Sash Lifts & Handles. Within our range, we have stylish designs that are certain to add both vibrancy and class to your household. To ensure that your sash window has been closed in a flush and effective manner, we have a range of Casement Fasteners. This will provide a strong and sturdy method to keep windows closed permanently. We have a selection of models made from materials like chrome and polished brass. If you want to regulate how far you want your sash windows to be open, then we have a selection of Casement Stays. These designs allow you to have full control over the amount of exposure you desire in accordance with specific weather conditions. Safety is also a concern with sash windows, especially within buildings that occupy vulnerable people. This is when you should consider installing a Jackloc Window Restrictor to make sure windows can only be opened at a set distance. 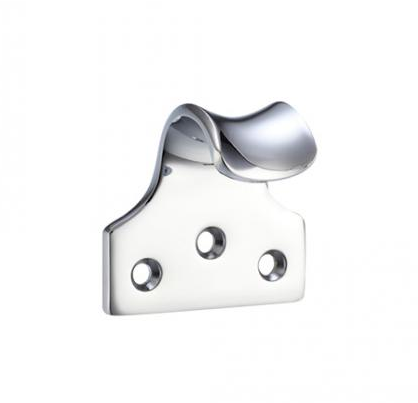 For a traditional method to keep your sash windows closed flush, we have Sash Fasteners. These neat designs allow you to keep windows firmly shut without compromising any existing space. Many sash windows operate on a rolling mechanism, in which case you should consider Sash Pulleys. They have been specifically designed for traditional rise and fall windows, using a carry cord to help counter balance any sash weight. We also have the 19mm Roller Sash Stop, which can be found on our Sash Stops page. This product is a high-quality brass socket screw. This particular sash stop is part of the Fulton & Bray range and has been manufactured by Zoo hardware. Maintaining a suitable level of balance for sash windows can be achieved with a Sash Cord. This will make the process of opening and closing windows far more smooth and effective. Sash Weights can be attached to cords to further increase balance. For a traditional method to keep windows closed, we have a selection of Fan Light Catches. These designs are mostly suited to windows that are situated at a high level. You will be able open and close windows by simply hooking a pole into the catch area. They come with a 10-year guarantee and have been manufactured by the Carlisle Brass. Finally, we have Fanlight Stays which allow you to mark exactly how far open you want your sash windows. This will alleviate the obstructiveness that windows can cause when they have been opened too far.